In May 2016, Challenge Records’ general director Anne de Jonge and I discussed a new international trio album recording, featuring André Ceccarelli, one of my favorite drummers. Less than a year ago, André and I worked together, performing and recording with Enrico Pieranunzi’s European Trio. Searching for a pianist, Jean-Michel Pilc’s wonderful music, solo piano and piano trio performances struck me as lightning. Although it actually took me some time to decide, from the very first moment I was already convinced I wanted him to join us. André and Jean-Michel are longtime friends, their musical collaboration spans over two decades. They instantly agreed to record the album. It was pretty exciting, since the trio never performed together and Jean-Michel and I never met before. The day after our concert with Enrico Pieranunzi at the 2016 North Sea Jazz Festival, André and I headed for the MotorMusic Studios in Mechelen, Belgium. That afternoon I picked up Jean-Michel at Brussels Airport. In the early evening, we set up the instruments at the studio and did a very short rehearsal. We wanted to get in touch, briefly, with my original repertoire and save our musical energy for the next two recording days. We were back in time for dinner and to watch the European Championship soccer semi-finale between Italy and France. For the record: Italy won. Around eleven o’clock in the morning, we started to record our (presumed to be one) album. Each composition was recorded in about three takes. We listened back after every two tracks and then decided whether we would go on. In about seven hours, A New Episode in Life – Part I was recorded. In the evening, I called Anne de Jong, discussing what we should do the next day. We agreed to record a second album. Since my repertoire was already recorded on day one, we decided to record free-form improvisations, as well as some standards from the Great American Songbook. Back at the studio, at eleven o’clock in the morning, we asked recording engineer Floren van Stichel just to let the recording run until we would say when. The complete Solar Suite and Blue Monk were recorded in one entire twenty-three minute take. I still remember Floren stammering: “Good morning gentlemen… what happened?” in our headphones, after stopping the recording. Just like the day before, we reviewed the tracks and instantly decided to continue. Spontaneously, we dove into the next improvisation or standard and went back and forth to the recording booth listening, after a few takes. We just started to play, not mentioning any titles or preconceived ideas. At a certain point, Jean-Michel suggested to play “All the Things You Are” as a very slow ballad. Next, I proposed recording “All of You”, my favorite Cole Porter tune. Within six hours, including lunch, we recorded the entire second album and listened to some of the takes again. Before we finished listening, Jean-Michel already headed back for the hotel. A bit later, André left as well. Floren and I remained in the studio to work on the rough mixes of the first day recordings, while savoring a glass of one of the finest Belgian beers. "A fresh and surprising combination, this trio. It takes you to the beauty of the music, where you also regularly sit on the edge of your chair." "Switching between all kinds of free improvisations, and with this the trio shows musical genius. As if they have been working together for years." "A New Episode In Life Pt. II " is not an easy album. It's a listening album that after listening again and again each time reveals more detailed beauty." "Again a very nice and entertaining album." providing the perfect texture for Jasper Somsen 's deep and dark bass sound. Jean-Michel Pilc's imaginary musical realm and sense of dynamics is full of suprises. 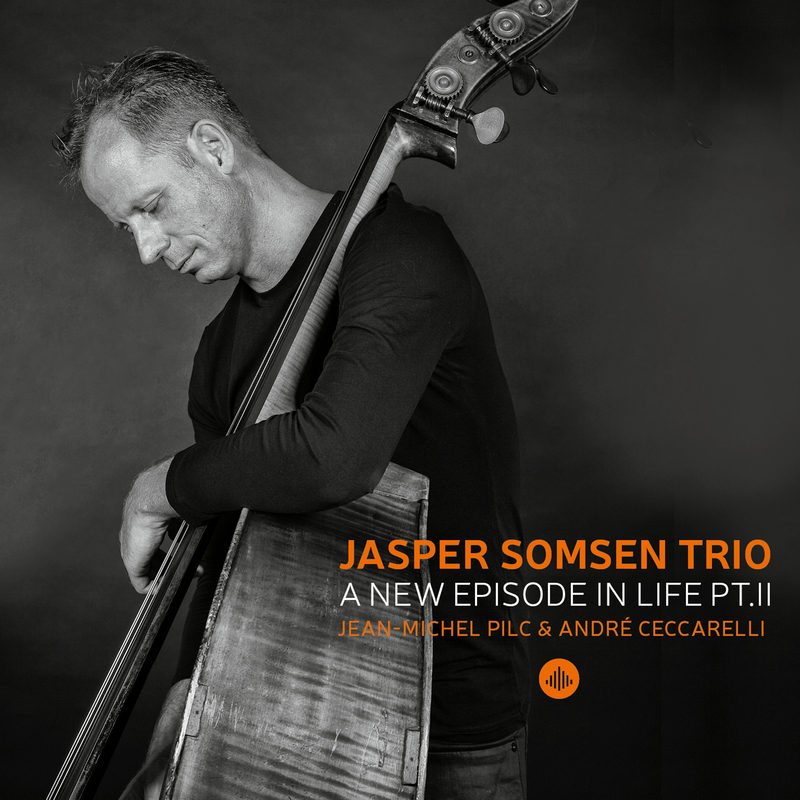 Even more impressive is the seemingly effortless interplay with Somsen and Ceccarelli." "... exciting combination of this trio, essentially hardly intertwined, with this time also an important part of Jasper's hot bass sounds." "Excellent recording quality gives extra shine, allowing the listener to be in the center of the music. Exciting from the first to the last note: a recommendation for adventurous programmers." "A creative impulse leading to a chain reaction between these three improvising musicians. Their music descending to depths where there are no limits in time and space." "Here finally a lively jazz that does good for those who play and those who listen! Only joy!"